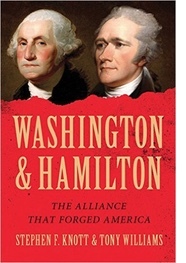 Stephen F. Knott is the co-author, with Tony Williams, of "Washington and Hamilton: The Alliance That Forged America." For well over two hundred years, Thomas Jefferson and his admirers have had to choose between two unflattering interpretations of George Washington’s presidency. The nation’s first president was either an accomplice in implementing Alexander Hamilton’s “counterrevolutionary” policies or a trusting man who simply did not recognize Hamilton’s ill-intent. Many Jeffersonians embraced the latter position as the more palatable option – better to believe that an elderly, intellectually-challenged Washington was unaware of Hamilton’s schemes than that the “father” of his country was conspiring with a closet monarchist. The image of a doddering President Washington was a myth, but it served to comfort anxious Jeffersonians. The truth was simply too much too bear, for while Washington treated Jefferson with respect and attempted to mediate the Secretary of State’s disputes with Hamilton, he sided repeatedly with Hamilton during his eight years as president. In fact, despite Washington’s distaste for political parties, the Federalist’s party’s “platform” was as much Washington’s as it was Hamilton’s. Remarkably, these facts continue to be ignored; understandably so, for attacking Hamilton was and is a far more acceptable approach than attacking the towering figure of George Washington. One sees this phenomenon in accounts dealing with the suppression of the Whiskey Rebellion of 1794, when thousands of “rebels” in western Pennsylvania defied a federal excise tax on alcohol, armed themselves, and at one point threatened to burn Pittsburgh to the ground. Federal agents attempting to collect the tax were frequently attacked, and in one instance, a “revenuer” was held in a distillery for three days without food, and told that he could secure his freedom by submitting to having his nose ground off by a grindstone. Washington repressed this insurrection on the grounds that he was constitutionally obligated to “take care that the laws be faithfully executed,” but that view tends to be dismissed in lore and legend. Instead, this episode of lawlessness on the part of whiskey distillers and their sympathizers is celebrated by progressive historians as an example of grassroots democracy in action. According to this caricatured account, the whiskey rebels were simple country-folk who abandoned their cracker barrels to defend their God-given right to produce moonshine. They fought to liberate themselves from an oppressive east coast establishment led by Hamilton and the “moneyed interest” – all traitors to the Spirit of 1776. This tale is Jeffersonian-inspired propaganda masquerading as history, but it has proved remarkably resilient. For Washington and Hamilton, the Whiskey Rebellion was a challenge to the rule of law, and while hindsight might allow one to dismiss the seriousness of the Rebellion, the threat was quite real to a newborn government whose viability was still open to question. Hamilton tends to be the villain in various progressive portrayals of the Rebellion, but it was President Washington who authorized the use of force against the rebels, and even led, for a time, the 15,000 man force (which Washington cunningly named “the Army of the Constitution”) that marched into western Pennsylvania. Washington hailed the demise of the Whiskey Rebels, noting that the uprising’s suppression “demonstrated that our prosperity rests on solid foundations,” for the American people were “ready to maintain the authority of laws against licentious invasions.”	For Jeferson, Washington’s response to the Whiskey Rebellion, or “Hamilton’s insurrection” as Jefferson called it, was further evidence of the great that the president had become the captive of a dictatorial inclined Hamilton. Nowhere were the conflicting visions of Washington’s Federalism and Jefferson’s Republicanism more pronounced than in their differing views on the French Revolution. Washington and Hamilton were repulsed by the ease with which the French revolutionaries and their American supporters countenanced mob violence and show-trials as a means of purging elements of the old order. In Washington’s and Hamilton’s view, there was no common ground between the American and French Revolutions; the former was characterized by a devotion to liberty, the latter by a passion for licentiousness. Jefferson welcomed the violence in France as an appropriate method to cleanse the new republic of any reactionary holdovers, and argued that if the revolution extinguished all but one man and one woman, it would be well worth the price. This was the same Jefferson who proposed executing any Virginia banker who cooperated with the Bank of the United States. In the end, Washington belatedly acknowledged Secretary of State Jefferson’s repeated attempts to undermine his policies, and in the final years of his life, he severed all contact with the Sage of Monticello. Jefferson reciprocated by refusing to attend the memorial service in the nation’s capital after Washington died, despite the fact that he was the sitting Vice President. Jefferson could hardly restrain his glee over the news of Washington’s passing, noting that it would allow for a reemergence of the “republican spirit.” Martha Washington would later note that the two worst days of her life were December 14, 1799, the day her husband died, and a day in January, 1801, when soon-to-be president Thomas Jefferson, whom she detested, paid her a courtesy call at Mount Vernon. Americans should put aside the caricatured account of their early history that pits Jefferson against Hamilton, for Washington was as much a party to this confrontation as Hamilton. 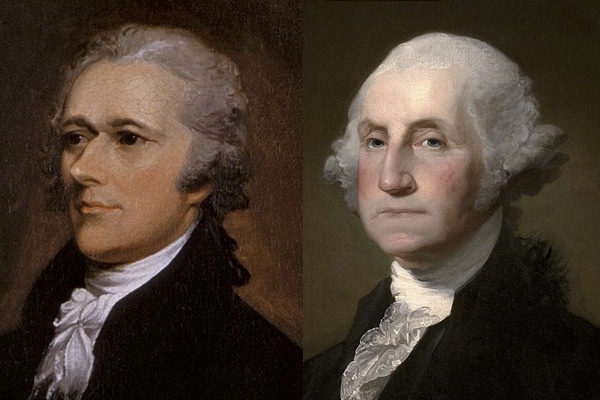 Despite his disdain for factions, Washington became the leading Federalist of his time, and his collaboration with Hamilton proved to be the critical alliance of the founding era.